PueblaHost Review 2019: Is PueblaHost a Good Hosting? PueblaHost is a Mexican hosting provider committed to offering pocket-friendly solutions to their local customer base. The company offers all their customers a 30-day satisfaction guarantee with their various hosting plans, with a refund if they fail to live up to your expectations. PueblaHost is a hosting provider committed to offering pocket-friendly solutions to businesses and individuals in Mexico. The company offers all their customers a 30-day satisfaction guarantee with their various hosting plans, with a refund if they fail to live up to your expectations. The website is currently only available in Spanish. PueblaHost’s shared hosting plans include the Professional Plan, Company Plan, and Unlimited Plan. They also have a range of reseller, VPS, and dedicated server hosting plans available. The vendor uses powerful modern servers capable of handling substantial workloads, making them a solid choice for e-commerce businesses or websites with complex databases. The vendor guarantees all their customers a minimum of 99.9% uptime. PueblaHost claims that all their hosting solutions are designed to offer the highest levels of reliability, security, and performance. However, at the time of writing, their main website was rated “not secure” by multiple search engines and browsers as their SSL certificate had been expired for over two months. Frankly, this doesn’t bode well for their customers’ data security. PueblaHost’s plans are a combination of flexibility, good features, and affordable prices. Do note that the prices listed on their website are an annual rate and in Mexican Pesos, so you’ll have to do some conversion to figure out exactly how they compare with other web hosts. 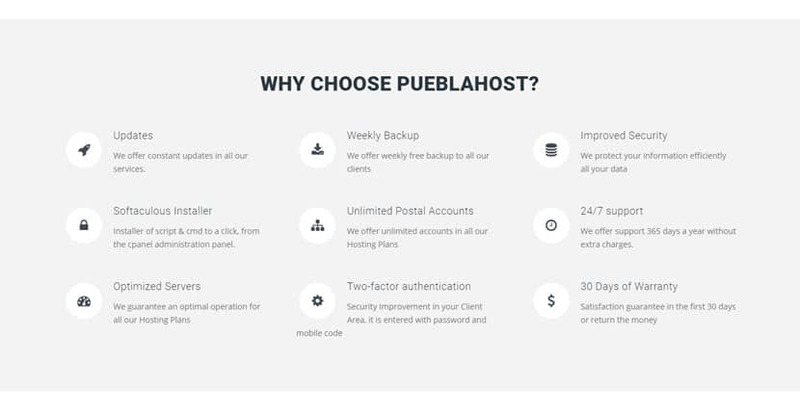 That said, compared to their competitors, PueblaHost’s web hosting packages are quite pocket-friendly, especially considering the amount of space, bandwidth, and even the free domain registration they’ve thrown in. What’s more, PueblaHost has a number of hosting plans for businesses of various sizes, and the company has made it easy for their customers to scale up from one package to another as their businesses grow. Their 30-day money back guarantee shows the company’s confidence in the quality of the services they offer. PueblaHost offers 24/7 technical support. However, the company doesn’t have a support email address, a live chat, or a phone number. To talk to their support team, you have three options: open a ticket, send them a message via their contact form, or contact them on Facebook or Twitter. In my experience, it takes quite some time to get support from this vendor. When I finally got a response, the information I received didn’t adequately address the concerns I’d raised; it felt convoluted and was largely irrelevant. The company does have a resource page through which you can try to troubleshoot and fix your own issues, though. PueblaHost has some pretty feature-rich packages priced at an affordable rate, which would make them an attractive option for SMEs in Mexico. However, their security and support leave much to be desired. Wondering how PueblaHost stacks up against other Web Hosting companies? Enter any other Web Hosting company and we will give you a side-by-side comparison.